Recovery Unplugged Treatment Centers kicked-off a multimedia marketing campaign in observance of National Recovery Month. The campaign aims to promote awareness, education, and empowerment throughout the recovery community and their loved ones. Content is being created that celebrate those in recovery, provide information to help people stay clean, and educate loved ones about treatment and the recovery process. Fort Lauderdale, FL, September 08, 2018 --(PR.com)-- In observance of National Recovery Month, Recovery Unplugged Treatment Centers has launched a dynamic and informative marketing campaign to help promote awareness, education and empowerment throughout the recovery community. The campaign will be targeted toward individuals in recovery, as well as anybody who knows someone currently struggling with addiction. It aims to help audiences better understand the disease of addiction, the everyday struggles of substance use disorder (SUD) survivors, common factors that can trigger relapse and more. It will also demonstrate the profound power of music to help individuals overcome their drug or alcohol dependency. Officially launched on September 1st, the campaign will feature regular blogs and social media posts covering various aspects of the recovery experience, including life after treatment, special obstacles faced by the recovery community, ways to maintain sobriety and different things loved ones can do to help their friend or family member avoid relapse. Recovery Unplugged will also be producing a video illustrating the treatment experience at our organization, and the multiple ways our clients have found their way to lasting recovery through music. As this year’s National Recovery Month theme is Join the Voices for Recovery: Invest in Health, Home, Purpose, and Community, the campaign will focus largely on the importance of community, support systems and the vital resources SUD survivors need once they leave treatment. Last year, over 72,000 Americans died from drug overdose, the highest number of single-year overdose fatalities on record. Deaths from overdose keep climbing, often because recovering SUD survivors don’t have access to the tools and support they need to maintain sobriety. This year, Recovery Unplugged is using National Recovery Month as an opportunity to mobilize the recovery community, as well as anyone who knows someone struggling with the disease of addiction. 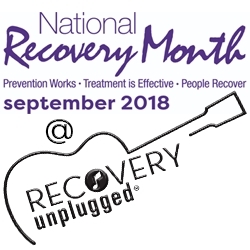 For more information on the Recovery Unplugged National Recovery Month Campaign, contact Dominic Nicosia at Dominicn@recoveryunplugged.com.